ATTENTION AMAZON CUSTOMERS: We are the ONLY legal seller of ANY TWO PIECE STRAWS on Amazon. There are many sellers infringing on our patent and selling versions of our patented straws that are not our brand. We cannot guarantee the safety of materials or quality of any straws not purchased thru GreenPaxx Amazon shop. We do, however, offer a 100% Lifetime Guarantee on our products. The Original Patented Two Piece Reusable Silicone Straws: Our unique design allows you to add an extra curved part to the bottom straight part to elongate the straw when needed for taller tumblers or shaker cups. (CLICK the video icon to see how this works.) This design allows you to see inside both pieces so no unknown mold build up. No extra cleaning tools needed. BENEFITS OF SILICONE vs PLASTIC or STAINLESS STEEL STRAWS: Silicone will not leach heavy metals or plastic chemicals. Silicone is soft and bitable, won't ding your teeth while driving or exercising like stainless steel straws. Bendable to fit into any water bottle, shaker cup, or smoothie cup. 100% Food grade, non toxic and naturally non stick. Wide diameter great for protein shakes, smoothies. Can be boiled occasionally for sterilization. A unique gift for teachers, elderly, fitness fanatics, blender users. Pair with our Cool Cap universal cup lid and a pint glass for a non toxic spill resistant cup. Sold Separately. GreenPaxx products are third party certified using strict European standards, to be free of lead, phthalates, BPA, and PVC. While this quality costs us more, we feel it's important. WE ARE PROUD OF OUR PATENTED TWO PIECE STRAWS and offer a full guarantee if purchased from GreenPaxx (USA owned and operated). Ages 3 and up. Fits cups up to 10 inches tall. With its patent-pending design, the COOL CAP has two rings on its underside that can each be stretched to fit several different sized beverage rims. It securely fits almost all drinking glasses, with the small exception of glasses whose rims are close in size to their base. (flute-like glasses) It even stretches to fit square rimmed glasses! The average size glass rim it will fit is 3.25 inches to 3.75 inches. The inner ring fits the average pint glass for reference, so will not fit glasses that have a much smaller rim than a pint glass. It also fits all wide mouth mason jars. 2) Will GreenPaxx products melt, warp or leach chemicals if I leave them in my car? GreenPaxx products are made from 100% food-grade silicone, an inert material that can safely withstand temperature ranges of -20°F to 450°F without degrading or warping. And because the silicone inGreenPaxx products does not contain any fillers like some silicone products do, it does not contain any harmful substances therefore will never leach any. 3) Can I use my COOL CAP and COOL STRAWS for hot drinks? Keeping in mind that you should always use caution when drinking hot beverages or soups, you can absolutely use them. Be sure your drink has cooled sufficiently then sip away! 4) Do I need special cleaning tools to clean my Cool Straws? 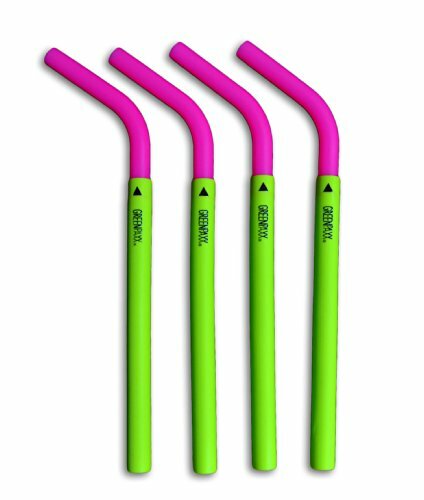 Unlike other reusable straws, GreenPaxx Cool Straws are made from non toxic food grade silicone, a naturally non stick material that repels debris, making them super easy to clean. In case you forget to rinse them immediately after use, just run them under warm soapy water while kneading the length of the straw and any stuck on food should easily rinse off. No pipe cleaners required! They are dishwasher safe but hand washing is recommended to prolong the life of the products. Never buy plastic straws again with GreenPaxx reusable Silicone Straws. An unexpected unique gift for anyone who uses a blender. The patented two piece design makes them easy to clean and easy to store in your utensils drawer. Non toxic silicone makes them a great alternative to BPA laden plastic and stainless steel. Pair with a Cool Cap and a rocks glass for a non toxic alternative to plastic sippy cups. Great for health and fitness buffs, children and seniors. Ages 3 and up. STRAWS and CAPS SOLD SEPARATELY.